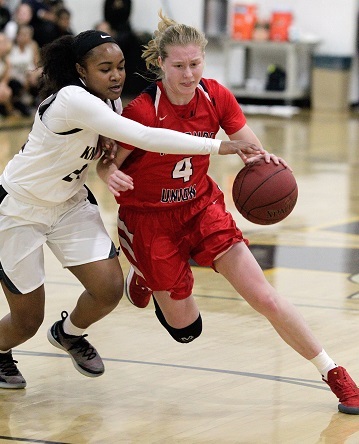 Redondo’s girls basketball team faces an uphill challenge after dropping its first of three pool games in the newly formatted Open Division playoffs. Seeded 5th in a field of eight teams competing for the Open Division title, Redondo (23-4) suffered a 68-61 defeat to host Bishop Montgomery (22-6), the 4th-ranked team in the playoffs. Redondo will now face the tough task of upsetting top-seeded Sierra Canyon (26-0) on Wednesday, a team which defeated the Sea Hawks 61-39 on January 26. Redondo’s four losses this season all came at the hands of Open Division teams, including back-to-back losses in November to No. 2 Etiwanda and No. 3 Windward. Redondo concludes pool play Saturday hosting No. 8 Troy. The Sea Hawks hope to shake off its sub-par performance against a Bishop Montgomery team that faced a 28-27 deficit at halftime. The turning point came in the third quarter when Bishop’s Khylee Pepe scored 13 of her 19 points. “I thought our girls played hard, but we didn’t play four quarters and didn’t play with poise,” Redondo coach Marcelo Enriquez said. “We had a really bad 3rd quarter where we had 8 turnovers and lost the quarter 21-9. Against a good team like Bishop you can’t have lapses like that. “We won the 4th quarter 24-20 but then it was our defense not being able to get enough stops. Kayla Padilla, who joined Pepe with a game-high 19 points, also had 10 rebounds, six assists and five steals for the Knights. Dylan Horton led Redondo with 15 points, but was held scoreless for the first 12 minutes of the second half. The Sea Hawk’s Anna Johnson had 13 points. In Division 2A, Palos Verdes (21-10) meets Santa Margarita (19-9) in the quarterfinals on Wednesday. The winner will play the Oxford Academy-St. Marys Academy winner on Friday. In Division 2AA, top-seeded Rolling Hills Prep (21-3) hosts Warren (12-14) Wednesday with the victory taking on the Huntington Beach-Roosevelt winner on Friday. Also in 2AA, Leuzinger (21-9) hosts Village Christian (16-11) in the quarterfinals with the winner facing the Millikan-Orange Lutheran victor on Friday. Ocean League co-champion El Segundo (21-8) takes on visiting Mayfair (17-4) in the Division 3A playoffs on Wednesday with the winner taking on the victor between top-seeded St. Bonaventure and Laguna Hills on Friday. Redondo’s boys team travels to Harvard-Westlake for its second-round game on Tuesday. Both Redondo (20-8) and Harvard-Westlake (19-7) had byes in the first-round. The winner will advance to take on the Brentwood-JSerra victor in the quarterfinals on Thursday. Semifinals are slated for Saturday with the finals being held Saturday, Feb. 23 at a venue to be named. Peninsula (18-11) hosts West Ranch (18-9) in the second round of the Division 2A playoff with the winner taking on either top-seeded Colony or Beaumont in the quarterfinals on Thursday. In Division 3A, second-seeded Palos Verdes (23-4) plays host to Eisenhower (17-8) in the second round with the winner facing the Covina-Pacifica victor in the quarterfinals. Top-seeded Rolling Hills Prep (21-6) travels to take on Ocean View (21-8) in the second round of the Division 3AA playoffs. The winner will face the Schurr-Cerritos winner on Thursday. For results and brackets, visit cifss.org.